the pink toque. a craft blog: BIG Knit & Stitch Freebie, Yay! BIG Knit & Stitch Freebie, Yay! I am SO excited to present my newest digital scrapbooking freebie kit: "Knit & Stitch!" With 11 papers and 51 elements, Knit & Stitch is the largest freebie kit I've made to date! The preview doesn't do this set justice because I couldn't fit everything onto it. I decided to go with a colour scheme I've been wanting to play with for awhile -- my traditional (favourite) brown and pink combo with a sea green or teal mixed in. And then a little touch of cream to complement the bolder shades. So what kinds of things are in the Knit & Stitch kit? Let's start with the 11 papers -- 6 soft knitted and 5 crisp linen style. There's also a delicate sheer cream paper mat with a felt flower trim that looks great layered over the background papers. Speaking of felt flowers, you'll also find similar felted flower ribbons, a plain fabric ribbon, and two rope cord elements. And that's just the beginning of the embellishments! There's 10 different kinds of fabric flowers, some with button centres and some with tall (and short) rope stems. I've included two frames with satin ribbon frame huggers, and two kinds of knitting needles: bamboo and metal. There's two pressed metal labels and two sets of word art using knitting words. I always include a few buttons and brads, and so there's a set of small butons with laced string in this one along with three square glass knitted brads. Since this is knit and stitch, you'll find three sets of straight stitching in the set colours and three sets of blanket stitches, too. And there's 8 different kinds of beaded knitting stitch markers that I had lots of fun creating. For tags, you'll find three traditional tags with satin bows and then my favourite: three felted tags in circular, rectangular, and word bubble shape, outlined in stitching. These are so cute that I think I'll make a mini addon pack later down the road just of tags and include a few more felted and stitched shapes. Whew! I think that includes it all! I really, really enjoyed making this set. If you've spent any time at my blog before you might've noticed that I do a lot of knitting and sewing, too. Combining my knitting and sewing love with my digital scrapbooking love just makes this the ultimate set for me! I may try to do some quick pages with the set to give away later on, just because I can't wait to scrap a page about my latest knitting project. If you make anything with my Knit & Stitch set, I'd LOVE to see (and feature you on my blog!) so be sure to send me some mail with your creations or drop me a comment with a link to where you have your layout posted. Don't forget to leave me some blog comment love if you like the kit! I hope you enjoy it as much as I do :) And you didn't hear it from me (ok, yes you did) but there just may be a sweet embroidery alpha ready for you tomorrow to go with this kit! I'm not good at keeping surprises so I'll just confirm that there IS a Knit & Stitch embroidery alpha sitting here waiting for you tomorrow, so be sure to stop by to grab it! Psssst.... you know what would go great with this freebie set? My fabric brads mini pack freebie! Includes 20 round glass fabric patterned brads that will perfectly complement just about any scrapbooking project. I've never done any digital scrapbooking, but this kit might just get me going. It looks really great. I've never done any digital scrapbooking before, but this kit may get me going. How cute! Awesome kit! !...Any chance of a crochet add-on??? jetfuelonly: I would LOVE to make an addon pack of crochet hooks and such! I'm not a crocheter (yet) -- what other kinds of things would be good to include, or is it just crochet hooks I'm missing? I am very excited about this kit as I love to knit, just don't have the time lately since I just started digital scrapping. I am also very excited to see what you have coming up related to football. We are also big BEARS fans and I have a ton of pics of my son from last year, we dress him up in BEARS attire for every game, including pajamas!! Thanks so much for sharing this wonderful kit! I'm so glad you included felt cause I love it. If you make the add-on, felt butterflies would be wonderful. It was fun to read your blog entry and "feel" your enthusiasm. I smiled all the way through it! gailg: we don't have kids yet, but our dogs own Bears jerseys and we dress them up for games. I can't wait to give away my Bears themed kit on Sunday -- be sure to check back for it :) And thanks for your comments! 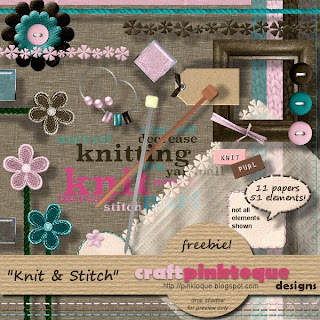 Thank You for sharing your freebie "Knit and Stitch" It's kewl! B.T.W. I noticed that you live here in Calgary, I do too! Bowness area..
OMG - this is TOO cute!! Luv your designs!